My Tahoe is mountain biking. My top three South Lake Tahoe mountain biking trails are Mr. Toad’s Wild Ride, the Van Sickle Trail, and the Powerline Trail. Of the three, my favorite is Mr. Toad’s because it has something for everyone. The first third of the downhill is pretty technical, then you hit some flowing sections where you can go pretty fast. Toward the end, you get a good mix of both, then you exit the trail on a fire road. 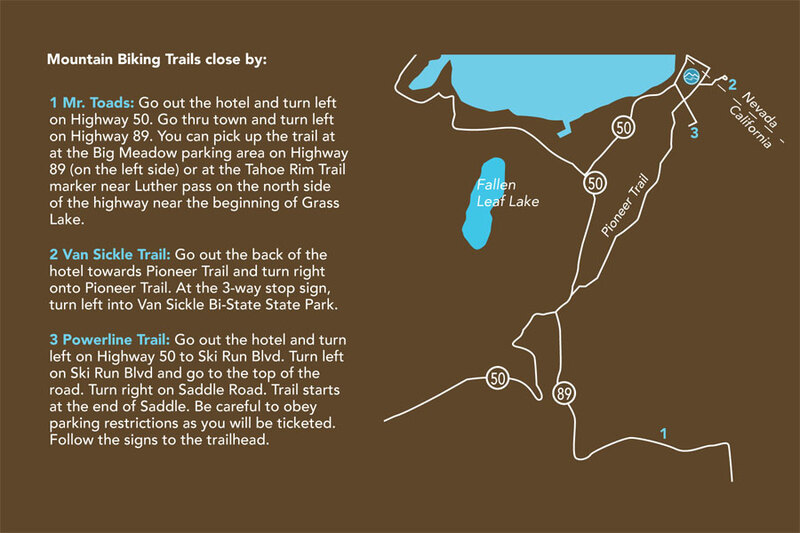 Van Sickle Trail is right behind the Lake Tahoe Resort Hotel, so it’s super easy to get to and has some great trails for mountain biking as well. Mountain Biking in the South Tahoe area can be a wild ride! Get the information and details you need to go on a safe and exciting mountain biking adventure when you stay at the Lake Tahoe Resort Hotel! Our staff can’t wait to help you make the most of your next stay with us!